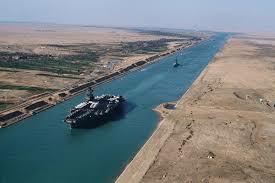 Linda Shenton Matchett: Traveling Tuesday: What’s the Big Deal about the Suez Canal? 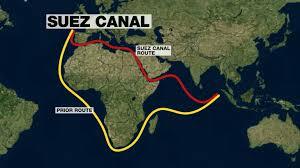 Traveling Tuesday: What’s the Big Deal about the Suez Canal? What’s the Big Deal about the Suez Canal? The North African Campaign began in June 1940 and continued for three long years as the Axis and Allied troops pushed each other back and forth across the desert. Did you ever wonder why this area of the world was so coveted? The answer lies in transportation. 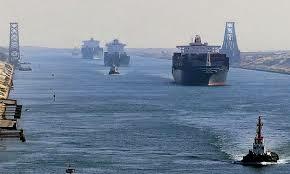 Both forces wanted to control the Suez Canal, an artificial waterway that connects the Mediterranean Sea to the Red Sea through the Isthmus of Suez. Before its completion, seafarers would have to travel around the southern tip of Africa to get from the Atlantic Ocean to the Indian Ocean. A huge project, the Canal was built between 1859 and 1869 and shortened the trip by 4,300 miles. Although never a British colony, Egypt was occupied by United Kingdom troops beginning in 1882 and remained under British control even after formal recognition of Egyptian independence in 1922. In the mid-1930s the headquarters of the British Navy’s Mediterranean fleet was moved from Malta to Alexandria. Fighting began when the Mussolini declared war on the British and French. Knowing his 500,000 men outnumbered the 50,000 British contingent, he sent his troops into Libya. A series of camps were set up but proved to be too far apart to support each other, and while the Italians waited for further instructions, British General Archibald Wavell took the initiative and performed a large-scale raid that led to the near collapse of Italy’s hold on North Africa. By early March 1943, the British Eighth Army crossed into Tunisia and within eight weeks had crushed the Axis Powers who surrendered on May 13 yielding 275,000 POWs. Certainly a huge success for the Allies, the campaign came at the cost of nearly 400,000 men.